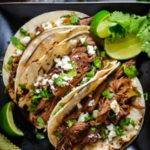 I’m trying to be a glass-half-full sort of person, so instead of apologizing that this Slow Cooker Ancho Coffee Shredded Beef recipe wasn’t out in time for you to pile it into your Cinco de Mayo tacos, I’m going to say that I’m doing a public service by sharing it with you SO FAR AHEAD OF TIME for next Cinco de Mayo. That works, right? But in all seriousness, there really is never a “too early” or “too late” for a taco recipe, you know? Especially when the filling is as deeply flavorful and surprisingly easy to make as this one. 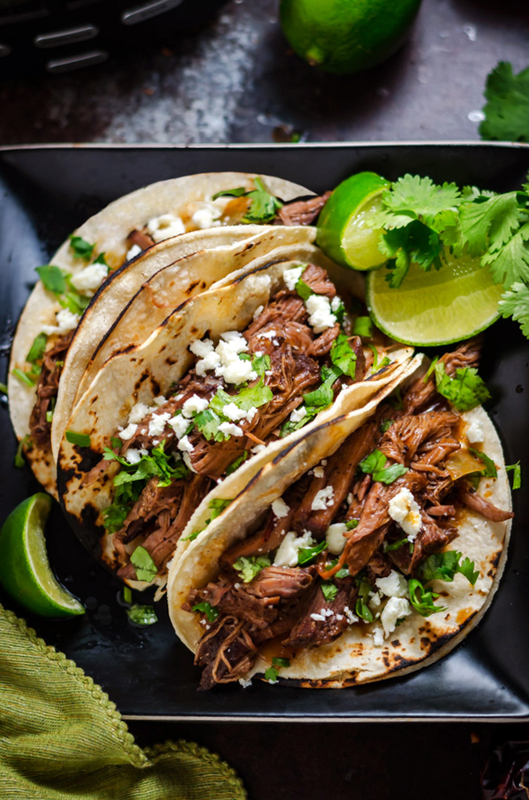 And if you’re still thinking that you’ve had enough tacos in the past week, I can think of about a hundred other ways to eat Slow Cooker Ancho Coffee Shredded Beef. 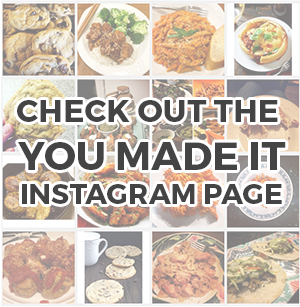 Examples include making sandwiches of it, serving it over mashed potatoes, piling it on top of polenta, spooning it over rice, tucking it into enchiladas, layering it onto loaded fries, and so on. They’re all great options… in fact, I think I’m going to have to do all of the above. And then make tacos with it again. At the very least it will give me an excuse to make this beef a bunch of times. When you run a food blog, you feel the need to justify repeating recipes to yourself, but this one is worth the (small amount of) effort even if it’s not checking anything new off of my blogging to-do list in the process. 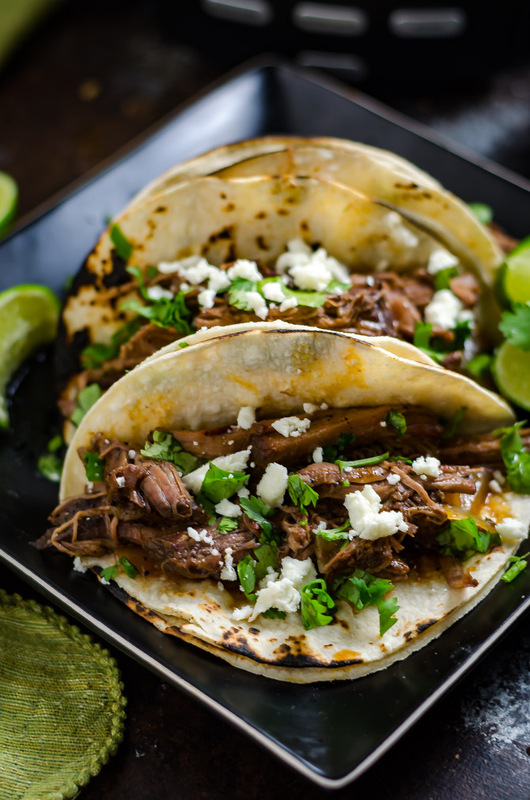 But let me slow down for a second because I still haven’t even touched on why I love this Slow Cooker Ancho Coffee Shredded Beef so much. Dare I say that it’s the best shredded beef I can ever remember eating? 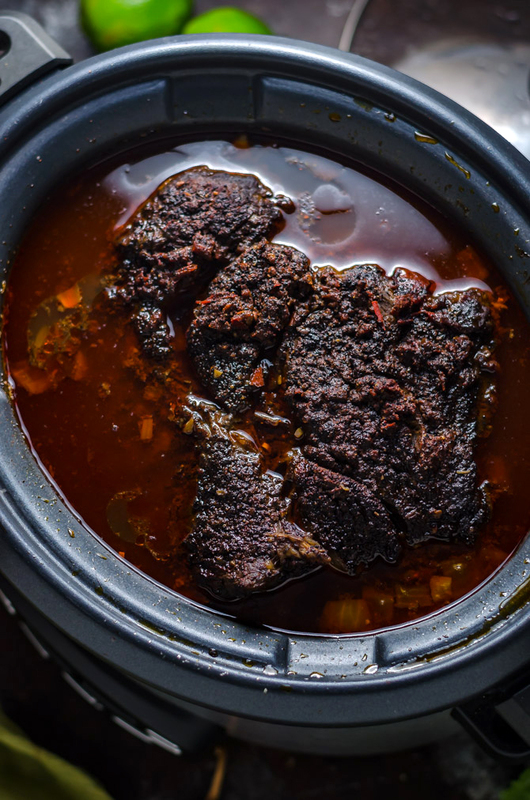 You don’t have to take my word for it, but you should trust the taste buds of the 43 others who ate this Slow Cooker Ancho Shredded Beef at my (belated) birthday party this past weekend. Of the 8 types of taco fillings I made, this one disappeared the fastest and was raved about the most. (And I don’t want to sound too conceited here, but they were all pretty fantastic). If that’s not proof that you should make this recipe ASAP, I don’t know what is. In a large baking dish, whisk together the coffee beans, chile powder, brown sugar, smoked paprika, kosher salt, cumin, and black pepper. Press the beef into the spices and pat the spice mixture all over. Place the onion in the bottom of a slow cooker. Place the spice-covered beef over top. Top with the garlic, chipotles in adobo, maple syrup, beer, and balsamic vinegar. Cover and cook until easily shredded, on low for 6-8 hours, or on high for 4 hours. 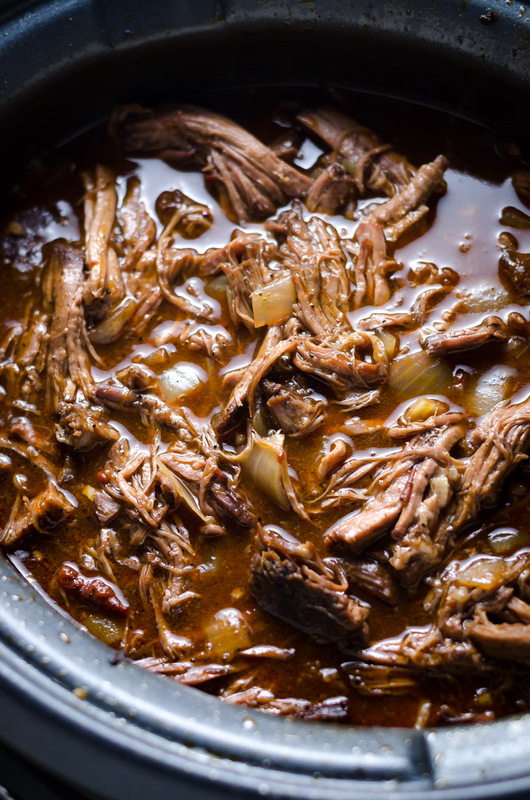 Remove the beef from the slow cooker and shred using two forks. Make a slurry by whisking together 2 tablespoons of cornstarch with 2 tablespoons of cold water. Whisk the slurry into the slow cooker liquids and set the slow cooker to high. Add the beef back to the slow cooker, cover and cook for an additional 30 minutes. 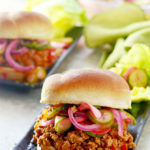 Serve warm in tacos, on sandwiches, over mashed potatoes, or as desired. HI I just have a question for you! 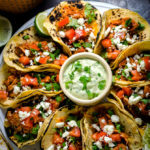 Love these tacos so delicious and I would love to have a giant taco party….how did you prepare your corn tortillas a head of time? I usually char the over a gas flame and eat immediately but how did you do it for your party? 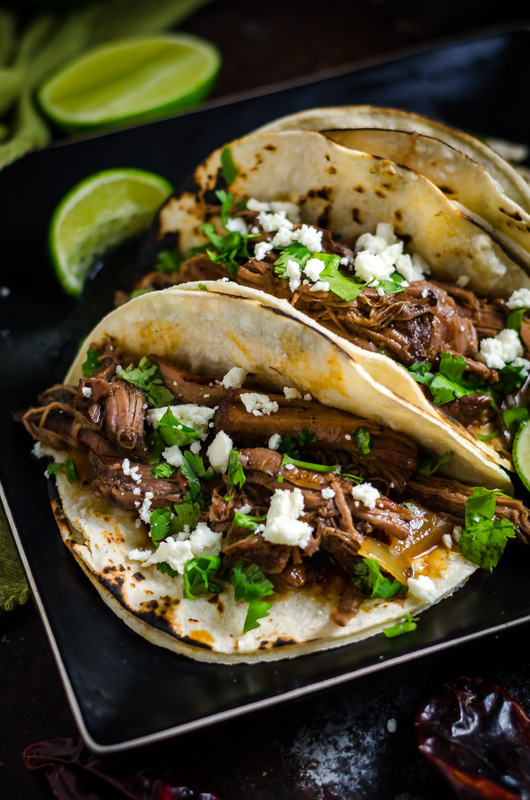 Corn tortillas don’t stay warm as well without going chewy, so they can’t be warmed too far in advance. Slightly before serving I toast ’em up and then wrap a big stack of ’em in foil to keep the heat in, and then I try to make sure that people cover them back up as they grab one. 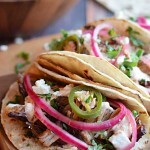 I also serve flour tortillas, and I find that at parties, people tend to go for flour more often for whatever reason. This was delicious! I love the chipotle flavor, so I added an additional tablespoon of those and tossed some oregano in as well. This is amazing with rice and avocado and super simple to pull together. I have made this recipe time and time again I love it soooo much! Want I meant was… We love it so much (meaning my wife and I) can’t get enough of it. I came across it one day I was really tired of having good old mac and cheese… no offense. And through it together after having to grab a few ingredients I didn’t have on hand. No big deal. It goes together very easy and as long as you make it with love this can’t go wrong wether it’s cooked at 4-8 hours this one always comes out tender and tasty! 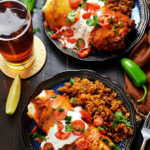 Been a fan ever since and love to try new recipes from your blog and cooking page thanks for all the time you spend putting these amazing recipes up for us so we can all have a tastier dish. WE are very grateful!